I'd absolutely love to support the game, but the only realistic scenario I can find is having to use an emulator and rom (illegally), something I want to avoid. I understand it will be different depending on the game and platform, I am just curious if there any moral and legal options of playing these little gems again? Basically, if it's not on something like WiiWare, Playstation Network, or Good Old Games, or re-released ala many of the Nintendo era Final Fantasy games, then you're going to have trouble finding copies and the equipment needed to play them. The fact that certain games are simply nearly impossible to purchase anymore is often the excuse for abandonware or ROM sites. It is worth pointing out that if you buy a copy on ebay for $100, the company that owns the game won't actually see any of that money. Whether this goes against your moral compass is up to you. That said, legally, it'd be against the law if you download a game, even if it's not being sold anywhere. Fortunately, more companies are joining the bandwagon of releasing older games for new audiences, so it's become easier to find old games for sale legally. Using ROM images from the net, or even from a copy of a game you own, is illegal. Period. If you want to be legal, you have to buy the original system or a licensed re-issue and the original ROM. As these games are out of circulation, and as such are practically relics by modern media standards, you've got to choose your battles. If you want to be thrifty and save a buck, you're going to have to hunt around and do the leg work. These items can be found at many vintage/thrift/flea market locations... often for 99¢ So you could scour the wastelands and possibly score one. It won't be MIMB... But it'll play your games. If you REALLY love the game just buy it. No price can be put on love! Own it and treasure it. Archive it. Take pictures of it with you on vacation and frame them. And check Craigslist. People often GIVE AWAY old stuff like this. You are essentially collecting art and design from the past... just with the added bonus of light, sound and interactivity. Sometimes really amazing pieces of the historical past of video games fetch VERY high prices. If that is the case, just owning it can be a fight. Be prepared. There are a lot of places that ship and have online inventory or are only a phone call away. I can personally recommend eStarland - They have long been a leader in online retro and import game support. 8 bit and up / 212-674-0201 - Very cool owner, and great shop. These systems support the original cartridges. And are also legal. In short, collecting vintage via the internet isn't always cheap. To save money you're can try questing around the country side of suburbia. MILLIONS of SNES systems are always around. Plus it's always good to get out of the house, off the net and meet your neighbors! But, unless you own a time machine, be prepared to be the high bidder or forever be incomplete in your collection if you're after a hot or controversial title. A lot of the other answers are long-winded and in-depth, so I'll take the short route. Buy a copy of the game. Used game store, yard sale, eBay, pick your poison. This only works if the game is still available or still working; some games with battery-powered save-RAM (or worse, battery-powered program-RAM, like some arcade boards) will cease functioning, so this won't be an option. The older the game or the less copies that were made, the more expensive it can be, up to several thousand dollars if you want to "legitimately" play a very rare game. Note that the original vendors get none of the money from this option. Get it off your favorite official download source. Virtual Console, PSN, X-Box Live. This only works if the game has actually been released on the service, which requires that the owning company still exists, still has the proper licenses, and such things. This is why you'll never see Earthbound on there -- lawyers afraid of licensing issues due to the music and references. Note that even if a game does see release, they're usually modified from the originals. Tecmo Bowl, for example, has all of the team names and players removed. There is no three. If you've got to this step and still don't have your game, sorry. There's really nothing more you can do. Your only option is to find a copy of it online, download it, and pledge to support your favorite developers should they ever release the game again, or perhaps purchase related merchandise. Writing a letter to the developers inquiring about a re-release optional, but may make you feel better. Sorry to disappoint, but in many cases you will end up going to option three. In terms of legality, purchasing the game is the only way to do it. This can either be through tracking down a physical copy of the game or going through one of the licensed distributors of the virtual content. If you want to be "legal" there's no way around those options. That said, me going to my local used game store and picking up a copy of Chrono Trigger for 100 bucks did nothing for Nintendo or Square. You're getting into the whole issue of reselling used games which the industry is not a fan of anyway. Neither option supports the developer at this point, but one is definitely legal. You decide what that's worth to you. Personally, if I don't care enough about a game to hunt it down for a ridiculous resale price (damn those nostalgic feelings) I just don't bother unless it gets a virtual release. Gametap is a fantastic site that is fairly cheap and has legal access to thousands of older games. Services like GameTap offer games to play (often emulated) legally via licensing from the copyright holders. Although I believe its mostly arcade games as I couldn't find any Nintendo/Sony/Sega games in their retro section. A growing number of games are becoming available on console marketplaces such as the Wii Virtual Console and the XBox Live Arcade. This is a convenient way to play older games through legal channels. Since you mentioned earthbound by name - it is available on the Wii U virtual console. Whilst the other answers deal primarily with re-releases or legal sites to play ROMs of games, I thought I'd share an option that has been an excellent addition to my living room: The RetroN 5! 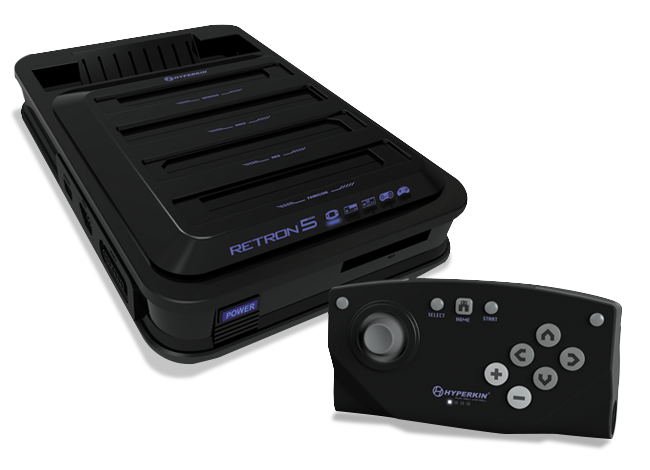 The RetroN dumps the ROM to the console, and plays the game via emulation at 720p. This allows the player to create/load save states, adjust the output resolution and/or filters and scanlines, and modify other options as well. Note however, that measures have been taken to make sure you cannot just load it up with ROMs from the internet (nor from your personal collection of cartridges): you still need to have the game inserted to play that game. It's one of the greatest (or worst, depending on who you talk to) things about it - you aren't tempted to just load up 200+ ROMs and leave your cartridges in the drawer gathering dust - it forces you to use original cartridges from your physical collection. Can back-up and restore game saves to the cartridges themselves. Think your copy of Pokemon Gold/Silver/Crystal's save-state battery is about to die? back up the save to the Retron, replace the battery, and reload the save onto the cartridge! The 'RetronN's default wireless controller suffers from about 4-5ms of input lag, which doesn't occur using original controllers (Mega Drive, NES etc). My suggestion would be to look into getting some OG controllers and relegate the wireless one to games where input lag does not matter too much (Pokemon etc). There are other retro consoles out there, such as AT Games' Retro Consoles, but I haven't tested them so I can't speak for their quality. Feel free to suggest them in the comments. Earthbound is now available for Virtual Console on the Wii U and the New 3DS, in the Nintendo eShop. It is also available in Europe, so if you own a Wii U or New 2DS/3DS, purchase it through there. Not the answer you're looking for? Browse other questions tagged backwards-compatibility legal or ask your own question. How can I play a SNES through a VGA monitor? Why does my Pokémon Gold cartridge seem to forget saved gameplay? What are all the differences between Mother 2 (JP) and EarthBound (US)? How do you play old Windows games that use Quicktime? Is it legal to import software(Game) from the US to India, which is not for sale in India?